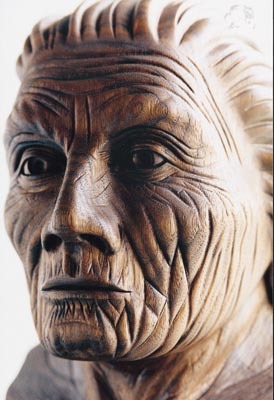 In the part one of this article I showed you how to show age on a carving of a human face, looking at the forehead, eyebrows and area around the eyes. 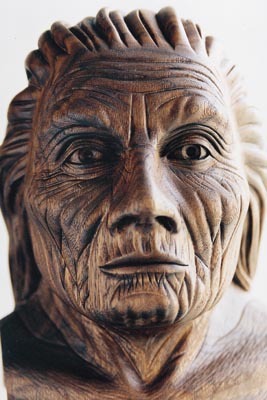 In this article I will carry the technique further to include the nose, cheeks, chin, upper lip area and skin texture, still using the Native American as my model. The lines on the nose tend to emerge from the direction of the inner corner of the eye and top of the cheek bones and normally run onto the sides of the nose. These lines seem to be more prominent with thinner people although I am sure there are exceptions. As we get older the nose can also become more pitted as the skin ages. 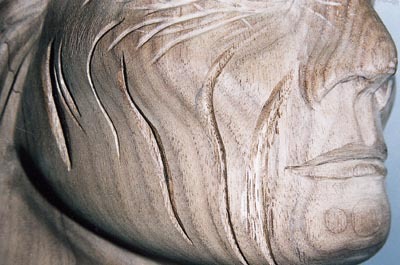 With my carving, I initially cut the lines along the edge of the nose with the 1mm No.11 and then made very shallow gouge cuts with an 8mm No.5 across the entire area to give the appearance of a pitted, aged nose. This was then sanded with very fine sandpaper of 400grit to ensure the gouge cuts would not be sanded away and lose their effect. Observe your model's nose and make the appropriate cuts. 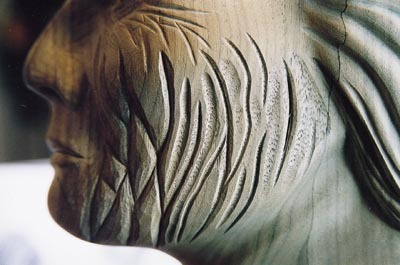 If the model does not have any distinguishing marks and you would just like to add some texture, read on and I will later explain how to add a very effective technique to your finished carving. The main area on our cheeks that is most noticeable when our skin ages and sags, is the position from the top corner of the nostril that runs down the cheek past the edge of the mouth and along to the corner of the chin. This crease can generally be seen on most people from their mid 30s and onwards, whether they carry facial fat or not. If your model is younger than this, you may find that there is just a hint of facial muscle around the corner of the mouth to the corner of the chin. This effect is achieved by drawing the protuberance in its position and cutting around it with a 10mm No.7. Finally blend the cut back into the face and chin with sandpaper of 120grit. 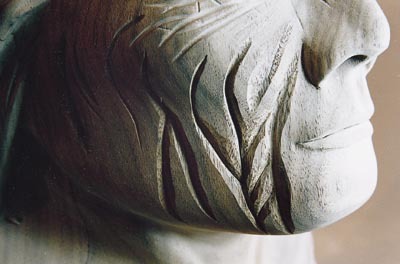 Have a look at photos 1-7 to see how I have carved both sides of the face with the front view finished before the chin was carved. I started from the position mentioned above and worked backwards across the cheeks. I used a wide range of gouges from a 1mm No.11 to a 15mm No.7, not to mention the No.1 chip carving knife to create the deep slits in the skin folds. 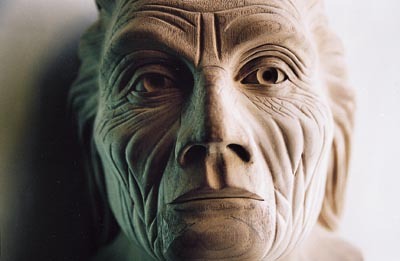 Your model may or may not be as old as mine and this will dictate how many creases will need to be cut along the cheeks. They will certainly not be exactly the same shape on both sides as symmetrical cheeks would like very strange indeed. Observe carefully and try to reproduce accurately what you see. 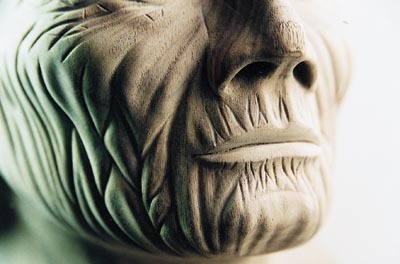 Make sure that you sand each crease after carving it to see how realistic it looks. For the purposes of this article I didn't sand mine until I had finished each complete cheek. The above photos show what the various cuts look like before and after sanding. Most of us will have that little wrinkle below the bottom lip; this is caused by a muscle on the chin called the mentalis. 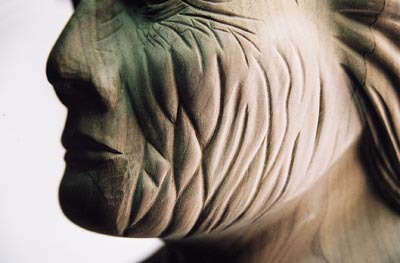 This moves up and down when we express the feeling of doubt and over time causes a crease on our skin (see photo 8). The area above the mentalis and underneath the lower lip will often show very fine lines that sometimes cross over each other. The areas around the corners of the mouth also take a lot of ware through general muscular movement over time and generally tell our age. These details are cut as before, using the 4mm No.7 to make the larger cuts, the 2mm No.11 for the crease above the mentalis muscle and the 1mm No.11 for the very small lines below the lower lip. The complete area is then sanded with 120grit apart from the small lines where 180grit is used instead. 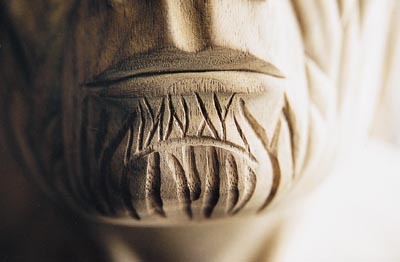 Again you must carefully observe your model's chin to see what details you have to reproduce, draw them onto the surface and then carve and sand them. If your model has a dimple on the chin, this can easily be made using a 10mm No.7 to make the indent and sanding down with 120grit to blend it into the surrounding areas. The area above the upper lip also tells a tale about our age. It takes a lot of ware from eating, talking, smiling and other jaw movements. With my carving I made the larger gouge cuts first with a 6mm No.7 (see photo 9), sanded them with 120grit (see photo 10) and then made the small cuts with the 1mm No.11, finally sanding down with 180grit (see photo 11). 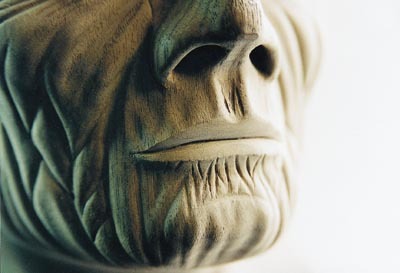 Once satisfied with the details you have applied to your carving, sand the wrinkles and creases through 180, 240 and 400grit. This should be performed very carefully, taking time to make sure all of the edges look naturally smooth with no sign of the gouge cuts. 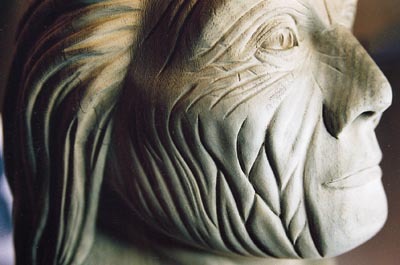 Once you have applied a finish to your carving (with oil, wax or a combination of the two) you will really see these wrinkles and folds come to life; this is when the reward for your work will be pleasingly obvious. To darken the wood and enrich the natural colours of the grain, I applied a coat of boiled linseed oil. This was followed by two coats of Danish oil to seal the grain and give the wax a good base to be applied on, and a few coats of medium brown Briwax, to bring out the rays in the wood grain and give the surface a subtle sheen. You can do the same or use whatever you have achieved good results with in the past, although I wouldn't recommend a highly polished finish as this tends to add too much reflection, naturally decreasing the effect of the facial details. 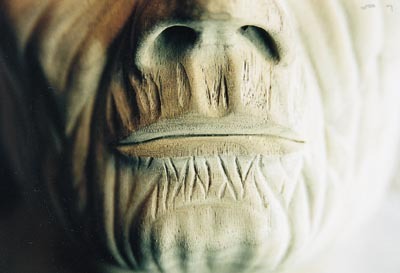 If your model is as old as mine you can apply a great realistic texture to the skin using a normal wire brush and carefully rubbing it over the complete surface of the face, following the same direction that the skin would naturally be tensioned by the underlying muscles. 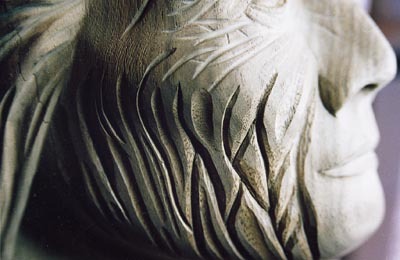 This technique will give you a much more weathered and realistic finish. This would not though be appropriate for a younger person’s face which would benefit from keeping the smoothness of the sanded finish.